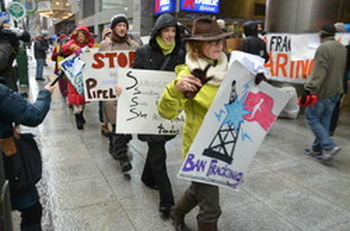 Philadelphia: Facing snow, wind, and cold, fifty protesters held a spirited rally at Sunoco Logistics headquarters in Philadelphia today. Protecting Our Waters, Clean Air Council, and 350 Philadelphia joined in pushing Sunoco Logistics to drop their plans for the Mariner East Pipeline, which would enable overseas export of natural gas liquids from the Delaware River. “This is a human rights issue,” said Bloom. The Mariner East Pipeline, if completed, would bring natural gas liquids (NGLs), propane and ethane, over 300 miles across Pennsylvania, through Southeastern PA to Marcus Hook. First, about half a million gallons a day of natural gas liquids will be exported to Norway from a Delaware River dock just across the state line in Delaware. That number will then increase to over one million gallons a day. Sunoco plans to complete the pipeline despite the fact that three similar pipelines, including two natural gas liquids pipelines, have exploded into 300-foot tall fireballs just in the past 3 months (IL, TX, MO). At least one of those exploding pipelines is owned by Energy Transfer Partners, which owns Sunoco Logistics. There is no evidence that this natural gas liquids pipeline would be safe for Pennsylvania residents, and tremendous evidence that it will harm human health both acutely, through air and water impacts from shale gas infrastructure; and long-term, through climate impacts. Negative health impacts from air emissions during every stage of NGL production, including drilling, fracking, fracking flowback waste, the MarkWest refinery, compressor stations and more. Multiple pathways of exposure include water, air, and food. Pipeline safety issues: where’s the evacuation plan for 300 miles of Mariner East pipeline? Three 300-foot fireballs in just the past three months shows this is not safe. Mariner East pipeline completion would harm land, trees, wildlife, and violate property rights by taking land for private profit using eminent domain. Pennsylvania’s air is being rapidly degraded by heavy fracking; Chester suffers from terrible environmental racism with intense air pollution, and Philadelphia gets a failing grade on air. This is the time to decrease, not increase, toxic air emissions. Ordinary people like Joseph Giovannini are being and have already been displaced by toxic emissions from the MarkWest refinery in Houston, PA, the starting point of the Mariner East Pipeline. The MarkWest refinery is degrading public health.